From June 2013 to June 2014, the market value of the Permanent University Fund, or PUF, increased 19.4 percent — from $14.4 billion to $17.2 billion — according to reports from The University of Texas Investment Management Company, the organization that invests money for the UT System. “Our revenues and the values of our assets in West Texas have grown substantially in recent years to allow for a larger endowment,” Chairman Paul Foster said after an August meeting of the Board of Regents. PUF is an endowment containing 2.1 million acres in West Texas that was created to benefit UT and Texas A&M University systems. The proceeds from the sale of oil, gas, sulfur and water royalties are invested in the form of stocks, bonds and equity interest to establish the Available University Fund, or AUF. Two-thirds of these funds go toward the UT System and one-third goes to the Texas A&M system. Kelley said horizontal drilling, a new oil drilling technique used to expose more surface area of oil bearing rock, can explain the increase in the value of the PUF on oil lands that were once thought to be in decline. Citing the fund’s growth, the regents decided not to increase in-state undergraduate tuition in May and approved an offset plan for the lack of increases in August. 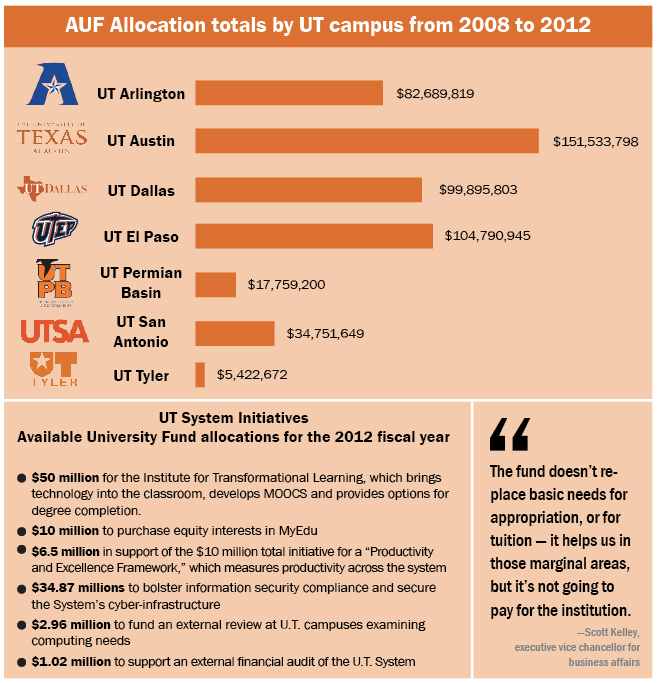 As UT-Austin is the only System institution that is legally able to directly use the AUF for academic operations, the System allocated $28.2 million in recurring revenue from the fund to the University. Under the offset plan, the System decided to cover costs and activities traditionally undertaken by the other eight institutions. In August, the growth in PUF also allowed the regents to approve an increase in PUF endowment distribution to AUF for the 2014 fiscal year, bringing the rate up to 7 percent. With the decision, academic institutions in the System will present proposals to Chancellor Francisco Cigarroa illustrating how they intend to use the additional funds. Kelley said the policy distribution rate is 4.75 percent but can be raised higher in response to financial returns that exceed their benchmark over a three-year period. “With the increase in what’s happening in West Texas and with a look at the oil and gas assets, there was a determination by the board over the last couple of years to increase that distribution, not necessarily permanently, but on a one-time, year-to-year basis to 5.5 percent,” Kelley said. Texas Gov. Rick Perry vetoed more than 20 bills Friday, but he left two amendments targeted at the UT System Board of Regents untouched. The amendments, part of SB 1, the state budget bill, were added by Rep. Jim Pitts, R-Waxahachie. Earlier this year, Pitts accused the regents of orchestrating a witch hunt to oust UT President William Powers Jr., an accusation echoed throughout the regular session. The amendments would limit how the regents can spend money, a power the state has not regulated in much detail. One amendment prevents regents that have not been confirmed by the Senate from using appropriated funds for travel. Another amendment eliminates board discretion over how to use money from the Available University Fund, a special fund only available to UT and Texas A&M University's flagship institutions. Until now, the UT System board has had discretion over how to use money from the fund. The amendment restricts the UT System's use of the fund to construction, major repairs and rehabilitation, equipment, maintenance, operation, salaries and support. Perry dished out 10 line-item vetoes in the budget bill Friday night, but Pitts' two amendments made it through unscathed — for now. The governor has until June 16 to veto legislation or let it become law without his signature. Although the UT System Board of Regents set the University’s tuition in May, tuition policies across the System for the coming years will top the agenda at the board’s meetings Wednesday and Thursday. The regents will discuss the progress of the new medical school in Austin and examine the costs and benefits of a guaranteed tuition option, among other issues. The System’s recently-announced effort to review policies concerning relationships between teachers and students does not appear on the agenda. The board will begin its agenda with discussion and “appropriate action” to recommend a guaranteed tuition option on all UT-System campuses and a report on UT System strategies to reduce undergraduate tuition. As the board decided in May, UT-Austin students will not experience a rise in tuition for the next two years. Students at three other UT campuses will also see a 0.0 percent tuition increase for the fall 2013 semester, while other campuses will experience minimal increases. As a result of unprecedented allocations from the Available University Fund, eight of the nine UT System academic campuses will raise tuition for fall 2013 at a rate lower than they were approved for by the board. UT-Arlington, UT-Permian Basin and UT-Tyler will not increase their fall tuitions at all, although the board had approved a raise of at least two percent for all three campuses. The UT-Brownsville, UT-El Paso, UT-Pan American and UT-San Antonio campuses will all raise tuition by less than one percent. UT-Dallas will raise fall tuition by 2.93 percent, which a System press release attributed in part to the campus’s four-year guaranteed tuition policy for incoming freshmen. UT-Austin does not currently offer a fixed-rate tuition option, though Governor Rick Perry has been vocal about his support for freezing rates and several state representatives have filed bills related to the issue. Mary Knight, University associate vice president and budget director, said she could imagine several benefits to offering a fixed-rate option, but emphasized that such a plan would take careful consideration. The eight campuses who will raise their tuitions at lower-than-approved rates will do so in large part because of allocations from the AUF made by the Board of Regents in May. According to the state constitution, UT-Austin is the only campus allowed to receive fund money to finance “excellence in its operations.” The System can grant fund money to other campuses in special circumstances to fund capital projects or other one-time purchases. Board chairman Gene Powell said the decision to allocate AUF funds was in line with the System’s broader mission. “The board is focused on the goals of the Chancellor’s Framework for Excellence, and two of the major tenets of the framework are accessibility to higher education and affordability,” Powell said in a statement. The board has not yet decided if it will utilize similar strategies going forward. “[That decision] is up to the board, but the regents have been very clear that holding the line on tuition is a chief priority,” System spokeswoman Jenny LaCoste-Caputo said. Published on February 13, 2013 as "Texas schools keep tuition at the same rate". UT System Board of Regents member Alex M. Cranberg and Executive Vice Chancellor for Business Affairs Scott C. Kelley applaud during the meeting. In an unprecedented decision, the UT System Board of Regents declined part of the University’s recommendation to increase tuition at a meeting Thursday, but did not do so for any other UT System institution. The regents froze tuition for in-state undergraduates for the next two academic years and raised tuition for all other students. This concluded the second day of one of the six regular meetings that occur each year and is the latest the regents have set tuition since 2004. The regents approved a 2.1 percent increase for out-of-state undergraduates, instead of the proposed 2.6 percent increase, for the next two academic years. The regents approved a 3.6 percent increase for graduate students that followed President William Powers’ recommendation, but only for one year. In the plan, the University will still receive funds that the proposed 2.6 percent increase for in-state undergraduates would have generated. Regents Chairman Eugene Powell said the gap will be made up with funds from the Available University Fund, the investment income from West Texas oil lands that are managed by the UT System. The University is the only UT institution that can use the AUF funds in this way, according to UT System Board of Regents press release. The endowment will provide an additional $6.6 million for each of the next two academic years. Powell said the University should not count on the funds for more than two years because they may not be available at that point. The regents did not follow Powers’ recommendation to increase in-state undergraduate tuition by 2.6 percent each year for the next two academic years, and both out-of-state students and graduate students would have faced a 3.6 percent tuition increase each year for the next two academic years. The email Powers sent out yesterday inaccurately referenced the recommendations Powers proposed for out-of-state undergraduates in December. Powers said the AUF funds will help to some degree, but it is not a recurring source of revenue like the revenue generated by tuition. He said recurring revenue is necessary to establish and maintain programs that the UT System desires. Powell commended programs aligned with UT System Chancellor Francisco Cigarroa’s Framework for Excellence Action Plan that debuted Aug. 25, 2011, which aims to increase productivity and efficiency. However, he said the tuition rates that were approved will provide a bridge between implementing the programs and the cost savings that the programs will eventually produce. “This has not been an easy process, but we want to continue our responsibility to have the finest institutions in America,” Powell said. Powell said setting tuition rates is a delicate balancing act and a tremendous number of compromises were weighed and balanced in order to maintain tier-one research status and control affordability. The investment firm for the UT System committed $200 million to Post Oak Energy Capital, a company that invests in the North American oil and gas industry. Last week, The University of Texas Investment Management Company committed the money to Post Oak over the next three years. UTIMCO is the entity which invests endowments for the UT System and the Texas A&M System. Part of the commitment to Post Oak is from the Permanent University Fund, which is a public endowment based upon West Texas land grants. A portion of UT Austin’s budget comes from the PUF, which UTIMCO manages. Mary Knight, associate vice-president and budget director for the University, said UT-Austin’s portion of the Permanent University Fund goes into the Available University Fund. For 2011 to 2012, the AUF is expected to provide about 13 percent of the academic core that goes towards University needs, like salaries and maintenance. Post Oak managing director Frost Cochran said in a press release that the company’s management team has extensive experience in the energy industry, which now includes the support of UTIMCO. Mark Warner, UTIMCO managing director of natural resource investments, said UTIMCO actively invests in the energy industry. Warner said UTIMCO knows Post Oaks professionals, and the company has a very good reputation. The commitment is unique, Warner said, because Post Oak targets smaller energy companies that cannot find money as easily as larger energy companies. “We believe that portion of the private market is much less competitive,” Warner said. Warner said he expects the Post Oak commitment to help grow the endowment funds that funnel into the UT and Texas A&M Systems, which is the objective of UTIMCO.